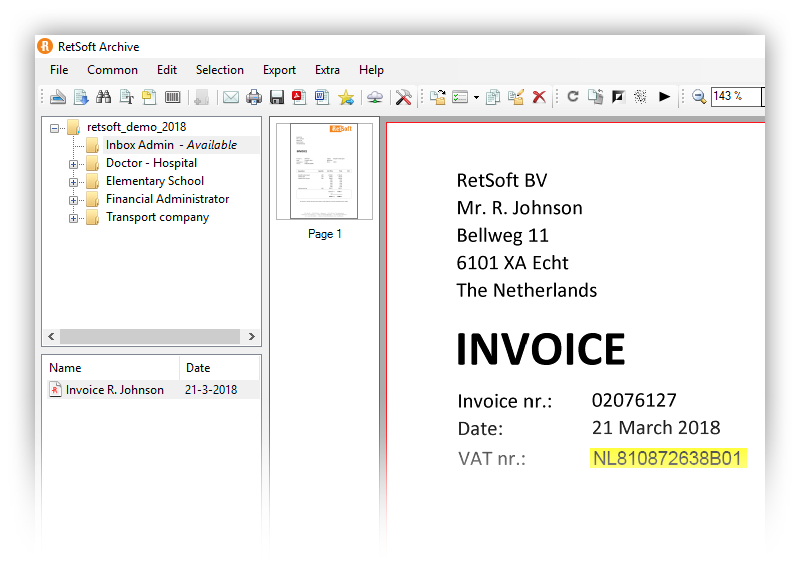 RetSoft allows you to set up a well-organized digital archive quickly and flexibly. 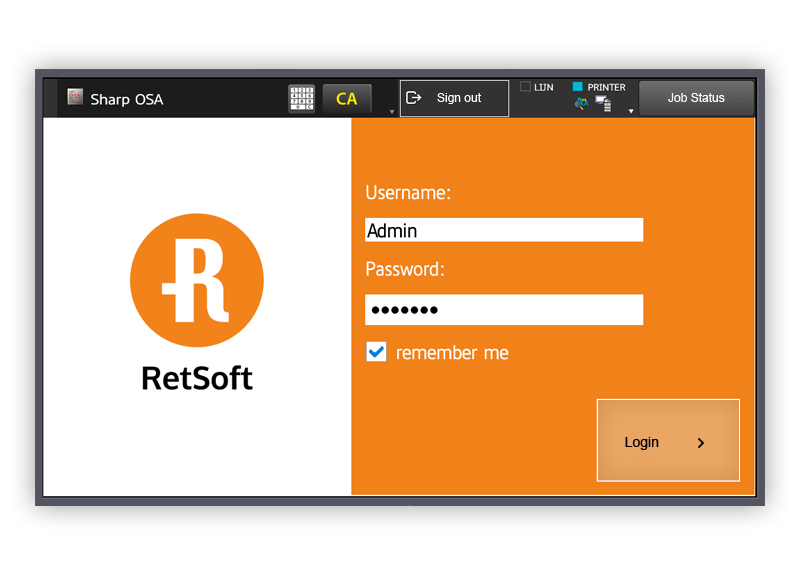 RetSoft allows you to set up a well-organized archive quickly and flexibly. 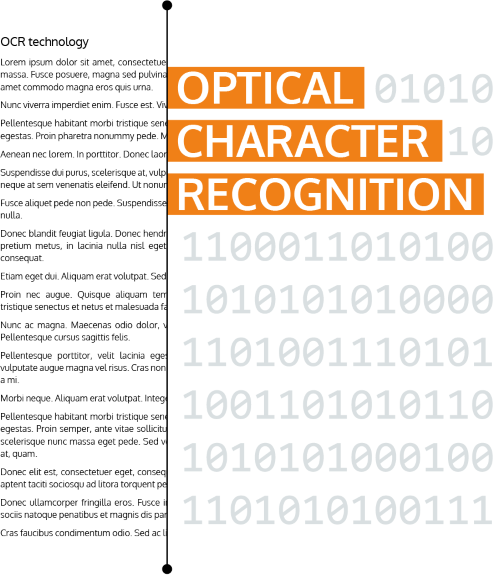 With our advanced OCR-Engine (text recognition) all typed content in your scanned documents will be made searchable. 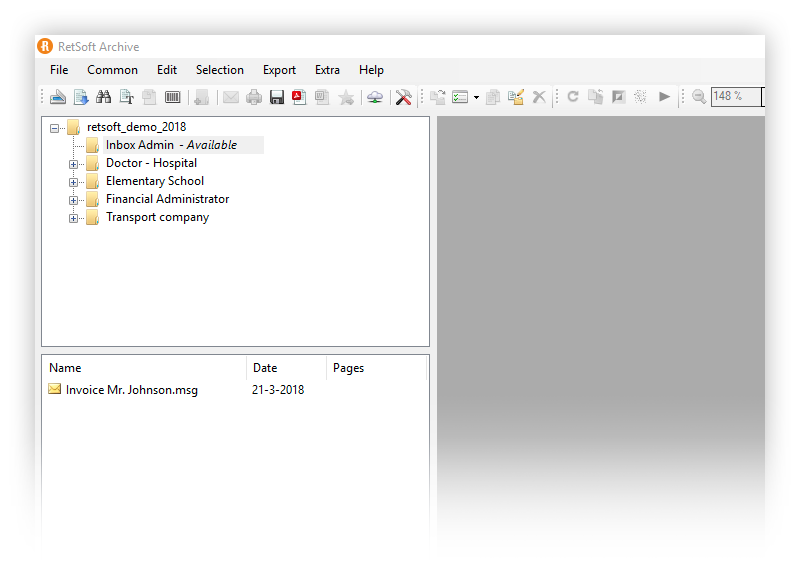 When you are searching for specific content our search engine will even look inside your scanned documents. Our advanced search engine will search in every piece of data it can find. 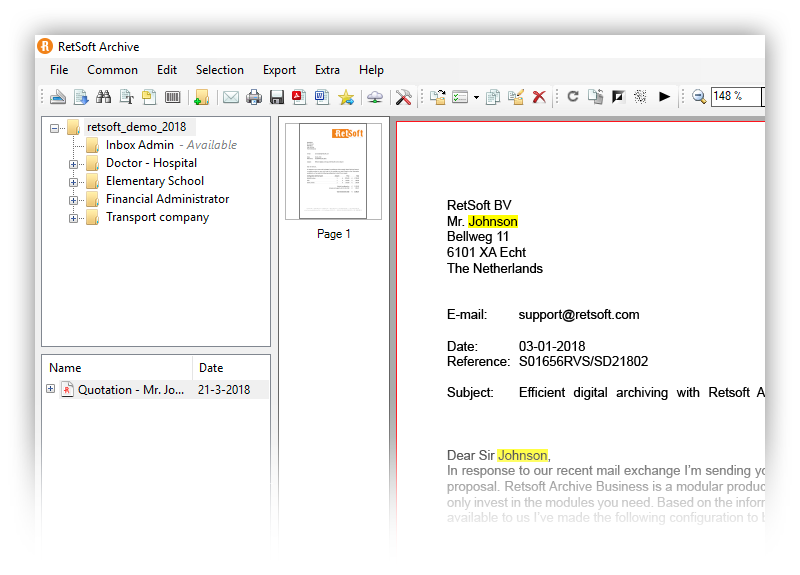 In scanned documents, or digital documents like Word, Excel and Emails. Even attachments inside an email will be searched and returned if a match is found. All results are shown in a simple list for you to browse through. 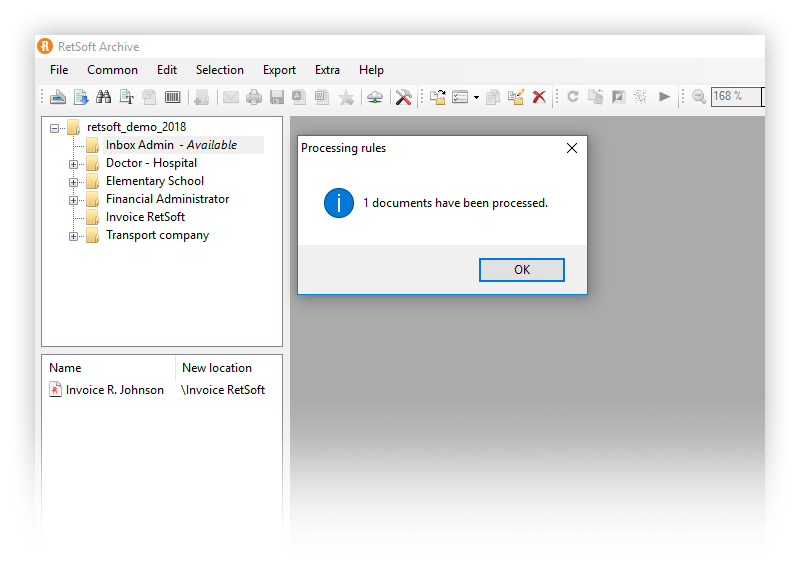 Use processing rules for predefined actions that will route new documents to the correct folder based on the recognised content in the document. 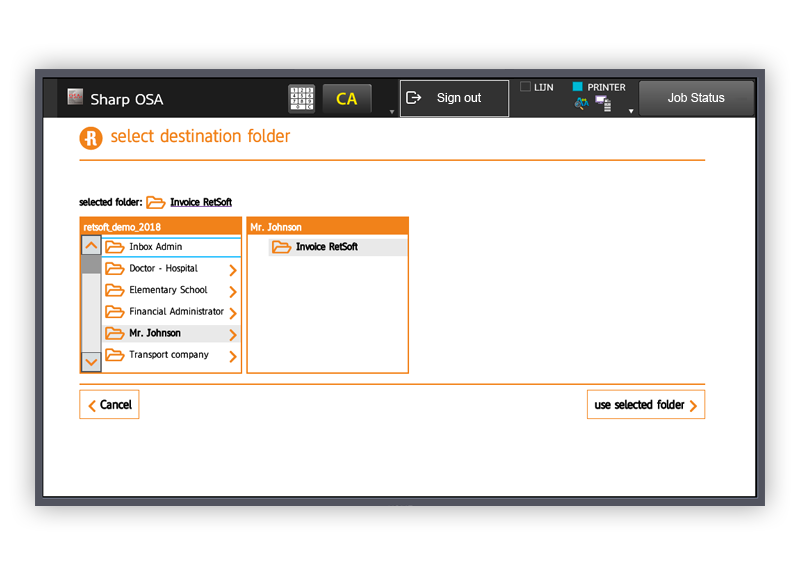 This way your archive will be kept consistent and finding documents even easier! 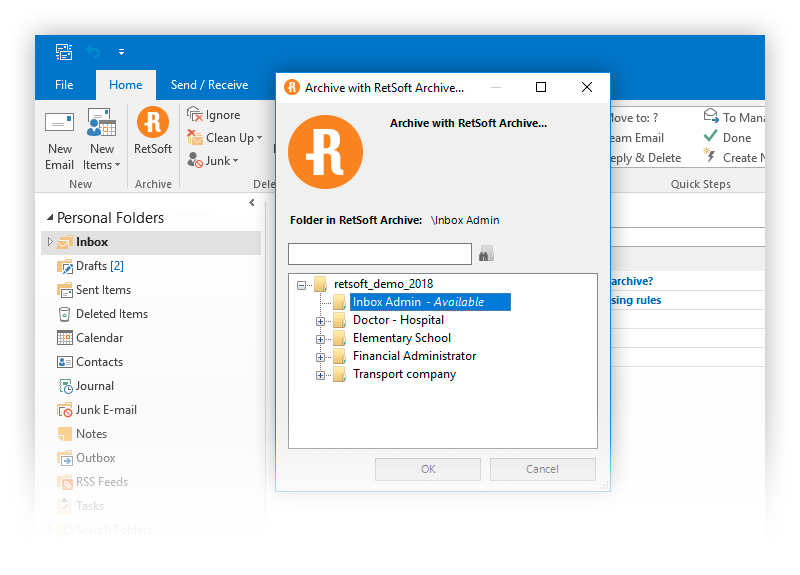 Archive your emails straight from Outlook (or Thunderbird) into RetSoft. RetSoft will then index the mail and the attachments inside. Now you will never have to worry again about finding an email! Every user can choose a special hot folder on their hard drive or network location. 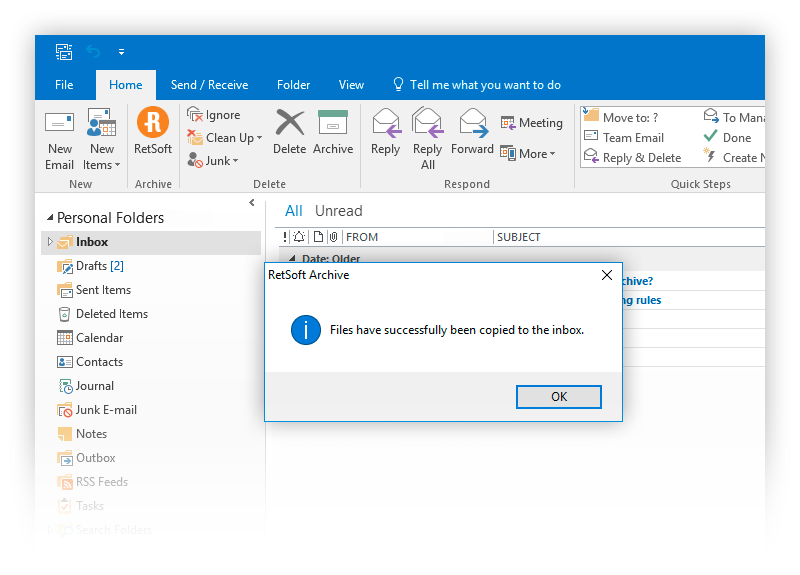 Each file that gets placed inside the hot folder will be imported into their own RetSoft Inbox folder and can be processed automatically using the processing rules, or can be archived manually. 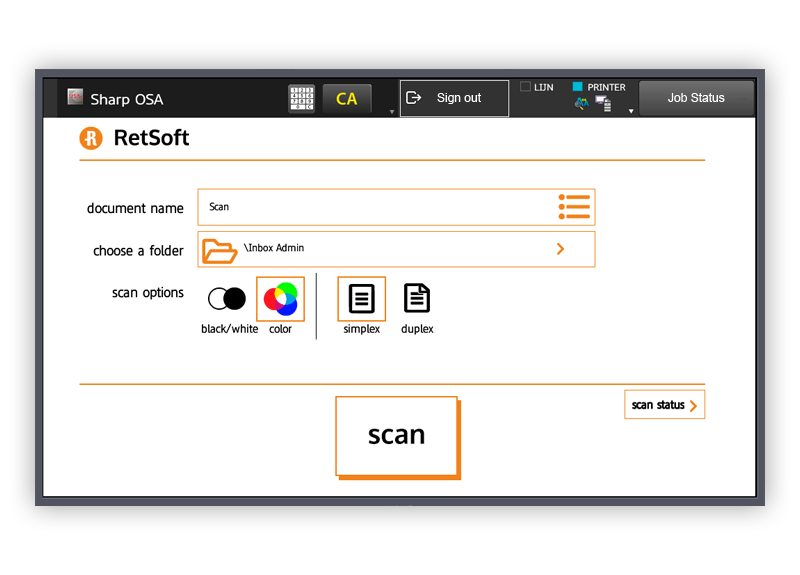 If you have a Sharp or an OKI Multifunctional Printer (MFP) you can use our RetSoft MFP connector to scan your documents into a specific RetSoft folder of your choice. If you have a different MFP you can use the scan to folder function. 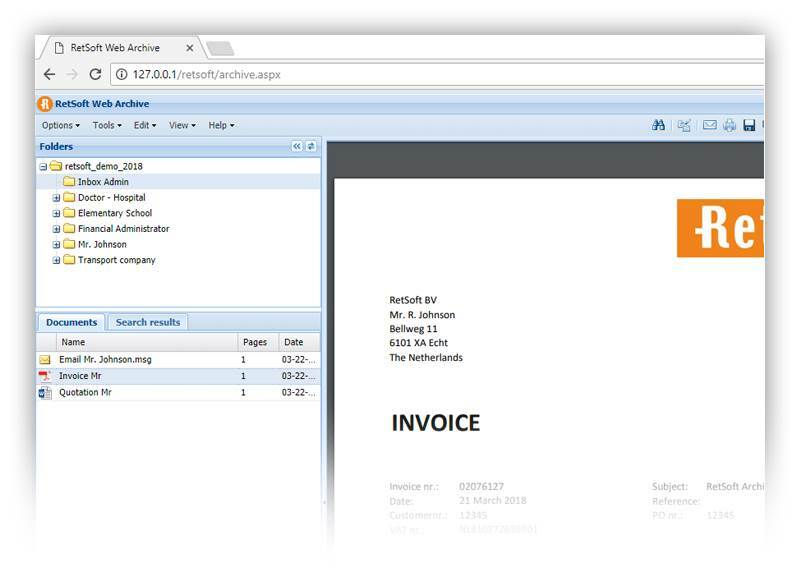 Archives created in Archive Business+ or Expert can also be viewed via a web browser. This way you have your entire archive available securely everywhere you go. 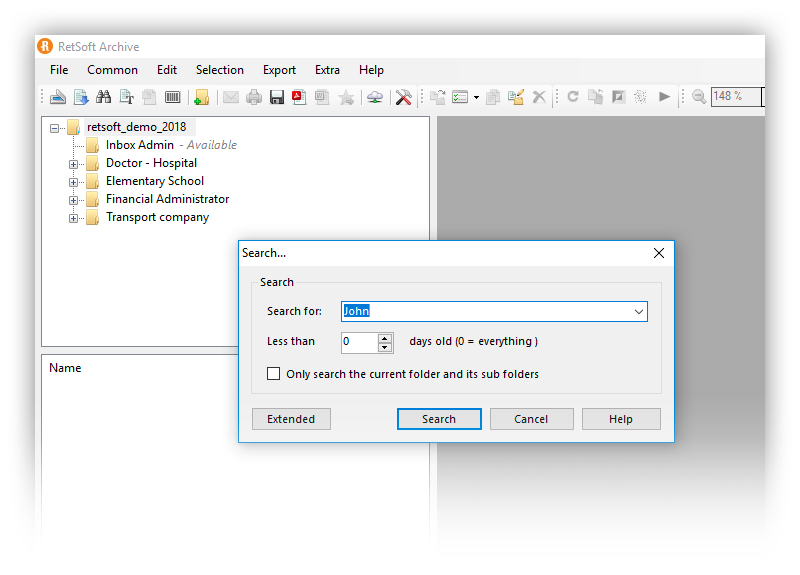 This is a read only function, so web users can only search, view and download files. RetSoft offers you a secure digital environment that meets all legal requirements. 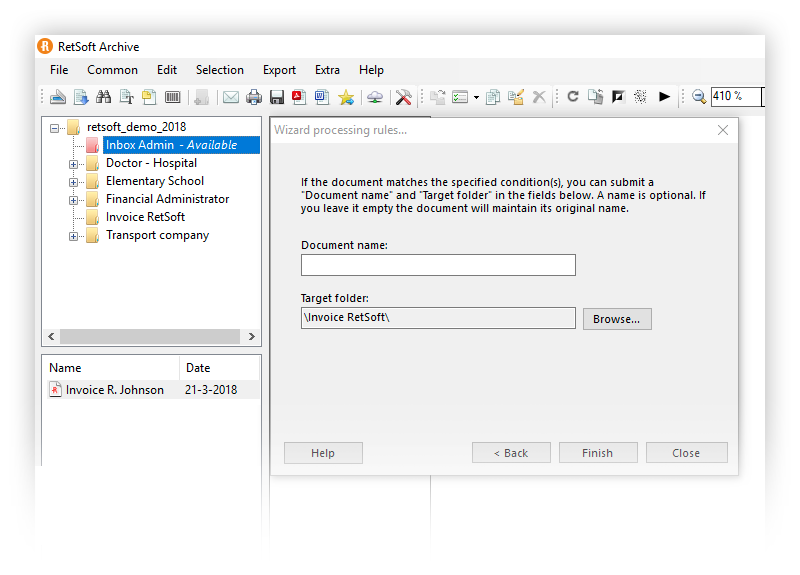 File and folder permissions can be set so users can only do and see what they are allowed to do and see. Files are saved in the database and not in shares on a drive. 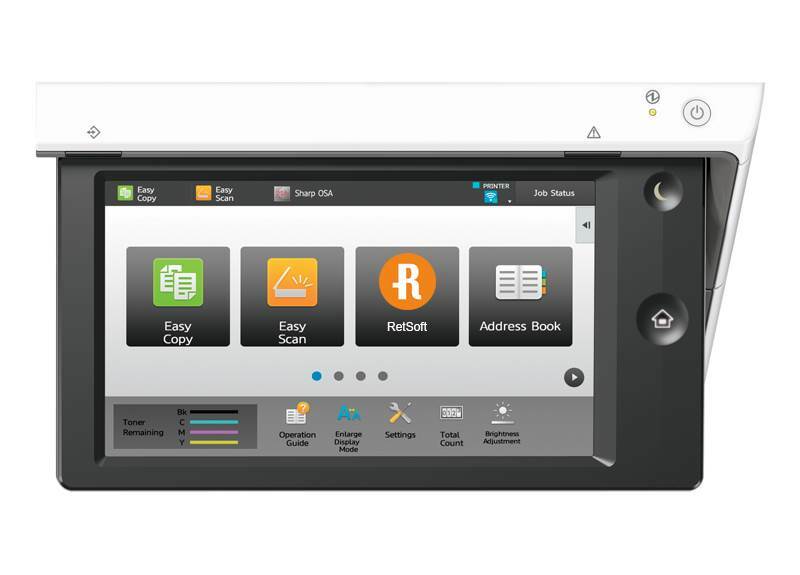 Access your documents with our Retsoft App from your smartphone or tablet (iOS and Android). Even without an internet-connection you can still access your information at any time via our handsome offline storage selections. 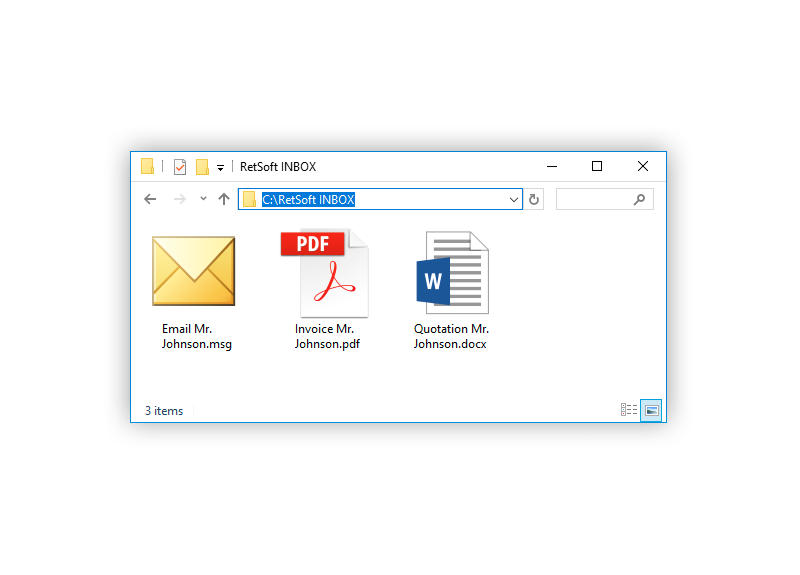 Choose a folder on your drive or in your network that is continuously synced into RetSoft. This is an easy way for another system to input files into RetSoft without needing to use the WebAPI. 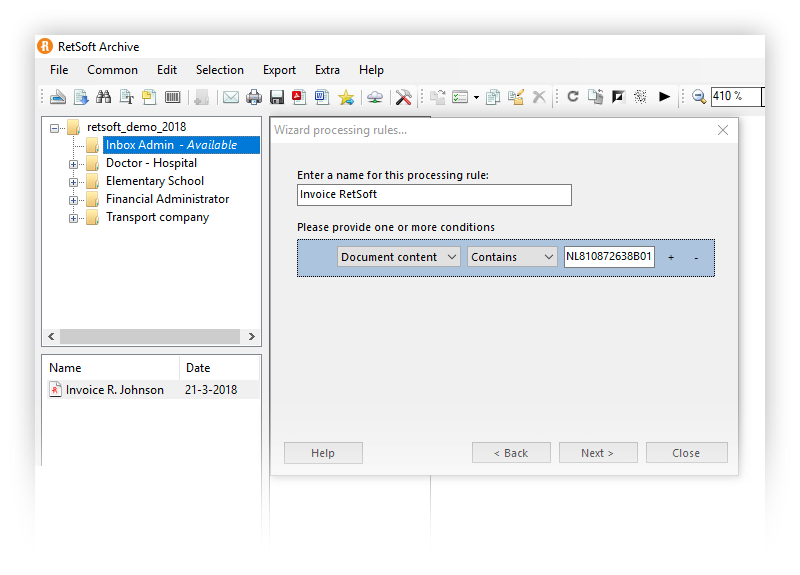 After the file sync RetSoft users can also find those documents fast and easy. Retsoft is unique because of its flexible scalability. 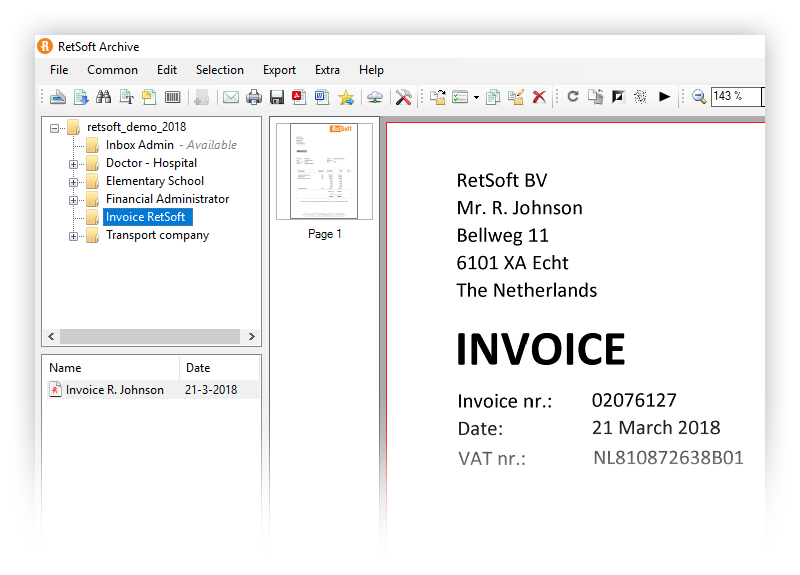 For years now, RetSoft is used‍ successfully by small companies with small needs, but also by large organizations with complex archiving processes. RetSoft offers many features and with its modular pricing it gives a perfect price/performance ratio. 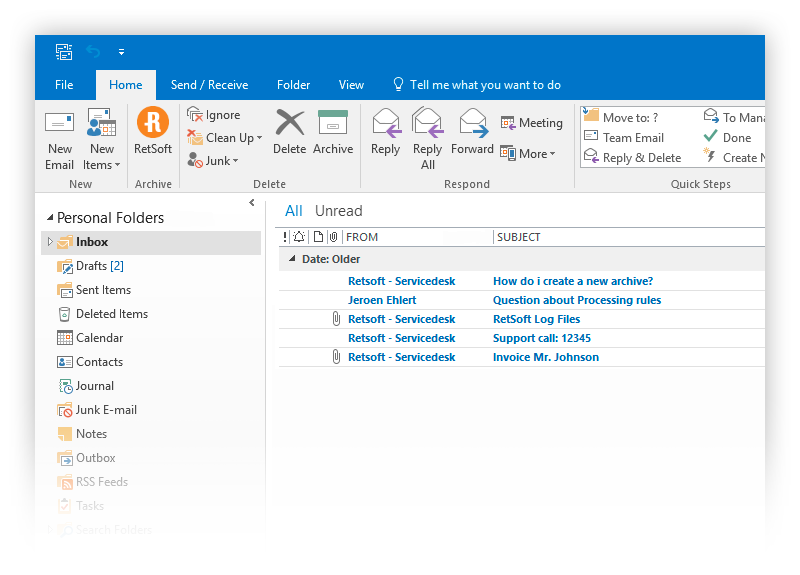 Archive your emails fast and easy with a single click from within Outlook itself. 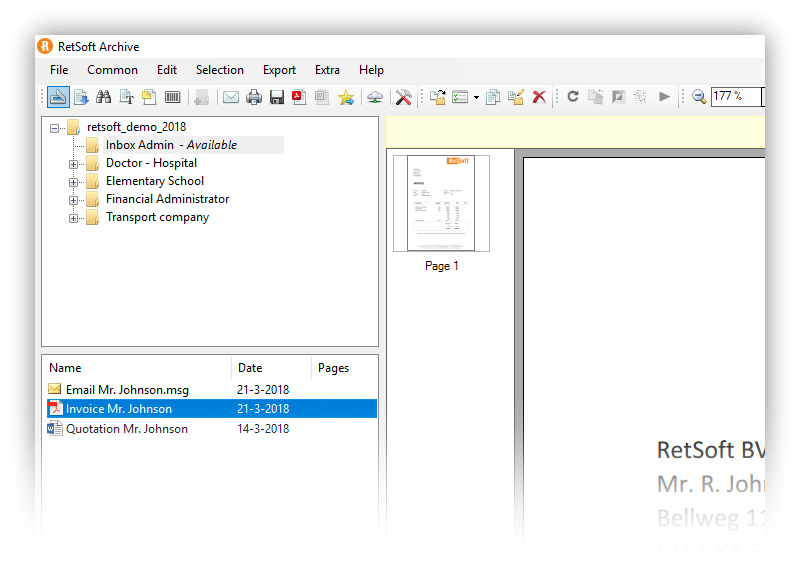 Word and Excel files are also archived in seconds with the RetSoft Archive button available in the ribbon. You like to continue archiving in your existing Windows file-structure? No problem, simply import your structure and files once and RetSoft will use the structure going forward. 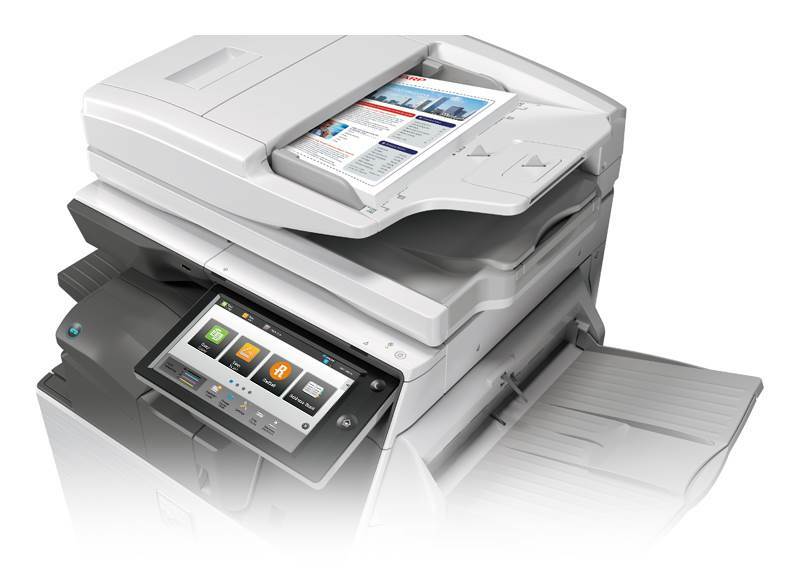 RetSoft works with every document scanner manufacturer, so there is no need to buy a new document scanner, just plug and play! 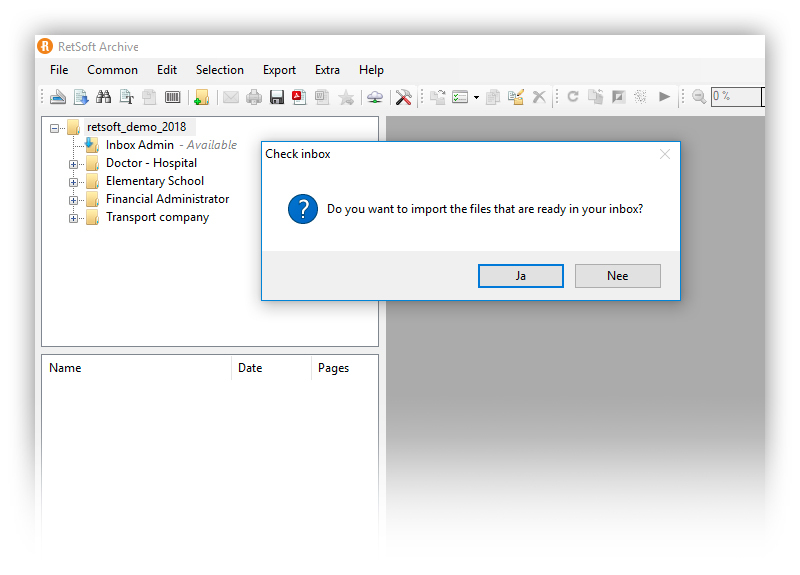 No more accidently deleted files! 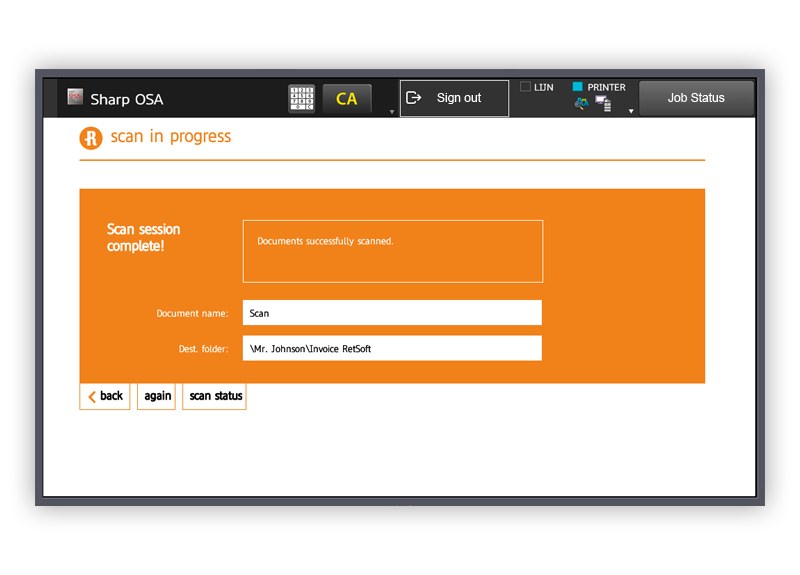 Files can be restored by administrator users. You also keep a local back-up of your files, so you can restore permanently delete files at any time. Archiving needs to be fast and easy. 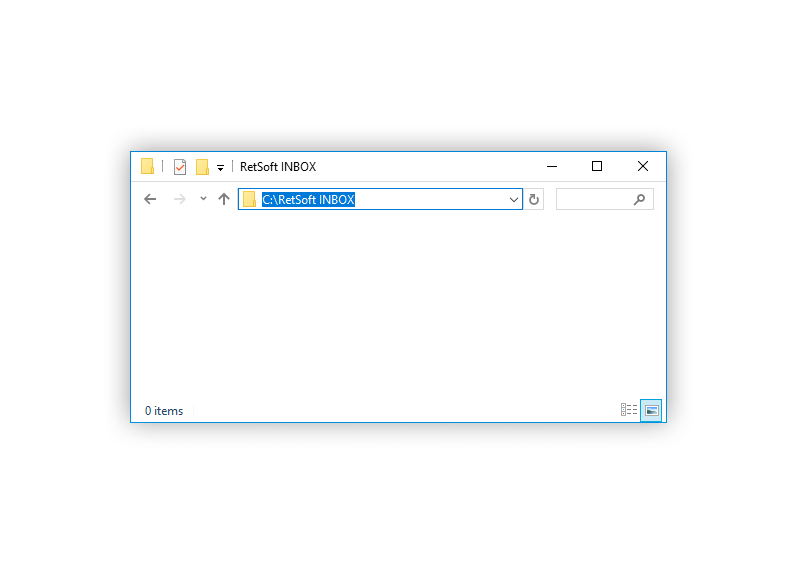 What is easier than simply dragging a file into RetSoft right from your Windows Explorer? 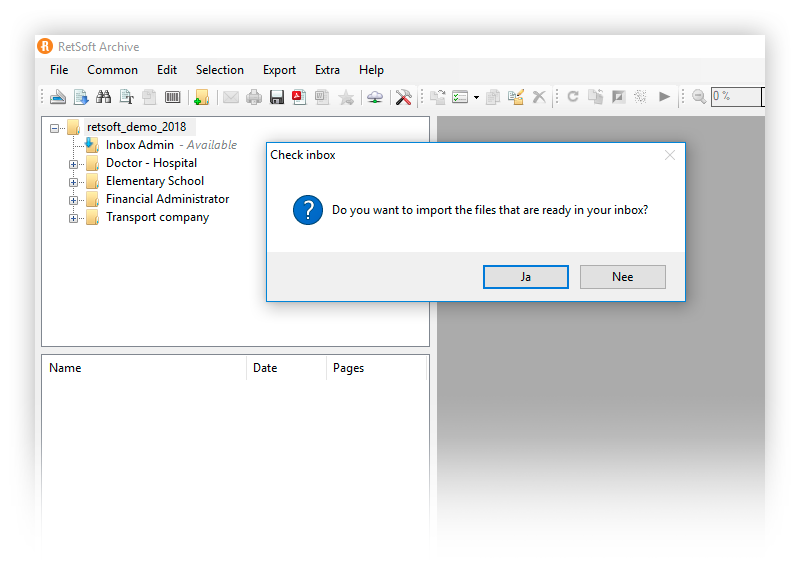 With drag and drop support you can easily add files to RetSoft, or drag files from RetSoft right into a new email! Get in touch with us for a detailed walk-through of RetSoft, we promise you won't be disappointed! Thank you! We'll get in touch soon to organise an online demo!